Of all the tools available to tweak and customize Windows, there are only two tools available to edit and tweak boot settings. EasyBCD and Visual BCD Editor are the only tools available to edit and repair boot related settings. As everyone knows, EasyBCD packs-in more powerful tools and easy-to-use than the Visual BCD Editor. 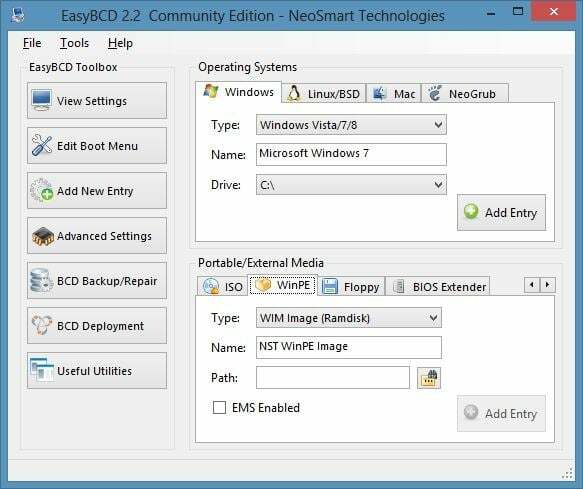 NeoSmart Technologies has updated its popular boot settings editing tool EasyBCD with the release of 2.2. The newest version of EasyBCD is fully compatible with the final version of Microsoft’s latest Windows 8 operating system. While the new build doesn’t include any revolutionary additions, it does include a number of improvements and fixes. Version 2.2 gets multi-language localization and VHDX support. Another new feature is that it now automatically creates a backup of Boot Configuration Data store when you run EasyBCD for the first time. And of course there are powerful features left over from the previous version. You can find tools to edit, backup, and repair BCD (boot configuration data) store, create bootable USB, edit boot menu, change boot timeout options, add new entry to the boot menu, boot from VHD, boot from ISO file, boot from USB drives on computers that don’t support USB booting and more. EasyBCD 2.2 is available as a free download for non-commercial use only. Aside from Windows 8, version 2.2 also supports Windows XP, Vista, and Windows 7 operating systems. And the best thing is, unlike other free software, EasyBCD setup doesn’t attempt to install browser toolbars or alter your browser settings. EasyBCD 2.2 remains an excellent boot settings editor for power users. Interested users can visit the below mentioned download page to start downloading the setup file. Users who are downloading from the developer’s page need to register (free) with NeoSmart Technologies to see the download link. Just checked! It’s still free but you need to register (has always been the same).